All the hard work from Rahul Dravid went into vein as RCB couldn't chase even a moderate total of 150. At the end of 10th over, RCB were holding upper hand in the game - 72/1. Rahul Dravid batted superbly to score 49 from just 35 balls which included 8 fours. But as soon as The Wall got out, RCB collapsed like a house of cards to 113/6 in 17 overs. Uthappa gave his best to make his team win the game, but failed when the equation was 18 required from 12. RCB were all out for 138. It's a do-or-die for RCB and they will have to give their best to win against the deadly RR and in-form MI. rahul dravid has always been and will remain a legend. 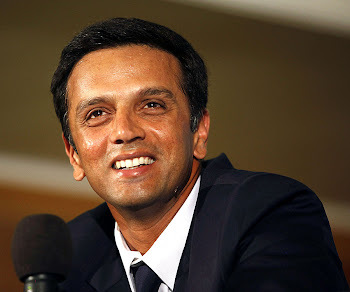 so what if rcb lost .they still have 2 matches to come .dravid played a gem of an innings on monday .if he just goes on this way ,a century may not be away from him.in the 2nd ipl when he came at no.3he had the pressure of being trusted by the captainbut also the eagerness to do well.i,m sure rcb will qualify for the semis.I use the same strategy that rahul dravid uses while playing.